Jay Taruc's I-Witness documentary titled "Batang Kalabaw" (Child Beasts of Burden) took home the 2008UNICEF Child Rights Award during the 45th Asia-Pacific Broadcasting UnionGeneral Assembly held in Bali, Indonesia recently. An eye-opening Filipino documentary about children workingas beasts as burden has been cited among "the best television programming onchildren's rights produced in the Asia-Pacific region." GMA-7's Jay Taruc and his I-Witness team won the 2008UNICEF Child Rights Award during the 45th Asia-Pacific Broadcasting UnionGeneral Assembly held in Bali, Indonesia last November 24. The episode "BatangKalabaw" (Child Beasts of Burden) was first aired on the Kapuso Network lastFebruary 11. Regarding his documentary, Jay said: "With the globalfinancial crisis serving as a backdrop, we were able to contribute to thegrowing awareness of how vicious this crime is. We wanted to focus on thecountryside, where many cases of child labour abuses are left unnoticed." The I-Witness documentary was chosen over the ninefinalists, including another Philippine documentary titled "Victor." It wasproduced by Cecilia "Cheche" Lazaro for ABS-CBN's late-night show Probe.In this episode, Cheche gives an update about a 12-year-old street kid who ranaway from his mother who works as a prostitute and constantly beats him. Theadult Victor then tells Cheche how he has fared all these years. Since its inception in 2001, the Child Rights Awardrecognizes the efforts of broadcasters in pursuing both the production of topquality children's programs and better news coverage of children's issues. Thisyear, the Child Rights Award received a total of 69 entries from countriesincluding China, Cambodia, Malaysia, Thailand, Indonesia, India, Hong Kong,Japan and the Philippines. The winning documentary from I-Witness features a14-year-old girl named Cherilyn who acts as both mother and father to her fiveyounger siblings. She is the family's sole breadwinner since her father wasimprisoned for murder and her mother suffers from a mental illness. 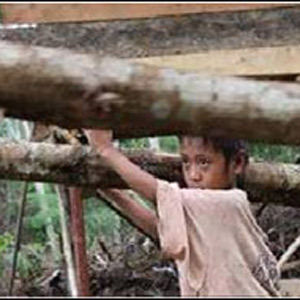 To earn a living, she and her young friends who trek up anddown the mountains of Agusan del Sur for more than 6 hours to carry logsweighing as much as 15 kilos. The children trek along muddy paths to the valley where buyers await to hand over a few coins fortheir endeavors. This is the second I-Witness episode that wonthe Child Rights Award following the 2003 episode "Selda Inosente" (Angelsin Prison) hosted by Kara David.